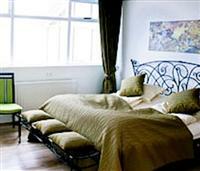 Located in a quiet area, the Glymur hotel offers luxury accommodation in Akranes, Iceland. The hotel caters to all categories of travelers, and is an ideal location to unwind from the daily stress. Glymur is located on the northern side of the Whale fjord, only 45 minutes from downtown Reykjavik. During your stay at the 4 star Glymur hotel, you can enjoy the many modern facilities on-site, including the outdoor geothermal water hot tubs providing a magnificent view of the Whale Fjord and a chance of experiencing the Northern Lights while enjoying a glass of wine, as well as several massage packages. Business travelers can use the hotel’s well-equipped conference room for holding company meetings or any type of team-building events. Some of the most notable places of interest in the area include the Akranes Museum Center - which displays a collection of old Icelandic houses, the Akranes Folk Museum holding a collection of exhibits from former times, and the Museum of Icelandic Minerals with its comprehensive display of Steinariki Islands rocks, minerals and fossils.